With over 100,000 known species, the phylum mollusca -- which includes animals such as octopuses, snails and oysters -- has an expansive family tree and it’s no wonder; they made their first appearance on earth around 500 million years ago. Taxonomists break these invertebrates down into seven distinct classes: Gastropoda, Polyplacophora, Bivalvia, Cephalopoda, Aplacophora, Monoplacophora and Scaphopoda. Gastropods are the largest group of mollusks, making up 80 percent of the phylum. This group includes snails and slugs on land and abalones and conchs in the ocean. The origin of the name “gastropod” tells quite a bit of what makes this group unique: Gastropoda is a combination of two Greek words, “gastir” which means “stomach” and “podi” which means “foot.” A gastropod’s stomach is actually near its head and it has one muscular foot that it uses to move slowly across the earth. Gastropods have heads with well-developed eyes and tentacles as well as a spiral outer shell. The one exception to the shell rule is land slugs, which brave the world without the protective hardware. Polyplacophorans are small marine mollusks called “chitons.” They live on hard ocean floors and rocky coasts. Their bodies are long and flat with an extremely strong foot for an animal of its size. A chiton’s foot contracts over a rocky surface and secretes a unique adhesive to keep itself locked on in the presence of battering waves and swift coastal currents. Their shells somewhat resemble a beetle’s. A chiton shell has eight overlapping segments and three thick layers. A chiton’s shell is so important that it will curl into a protective ball if it becomes dislodged from its body. Bivalves, or pelecypods, possess two shells. Some of the most commonly recognized mollusks in the world, this group includes clams, oysters, mussels and scallops. Around 15,000 species of bivalves are recognized throughout the world’s marine and freshwater habitats. Perhaps the most distinct characteristic of bivalves, their split shells, grow from the inside out; they secrete the shell material which accumulates into a hard, protective coating. Pearls are made much in the same way. Clams, oysters and mussels coat any irritants such as sand that enter their shells with the same material, thus creating what we know as a pearl. Scientists believe bivalves do this to make the irritating intruder smoother and less painful. 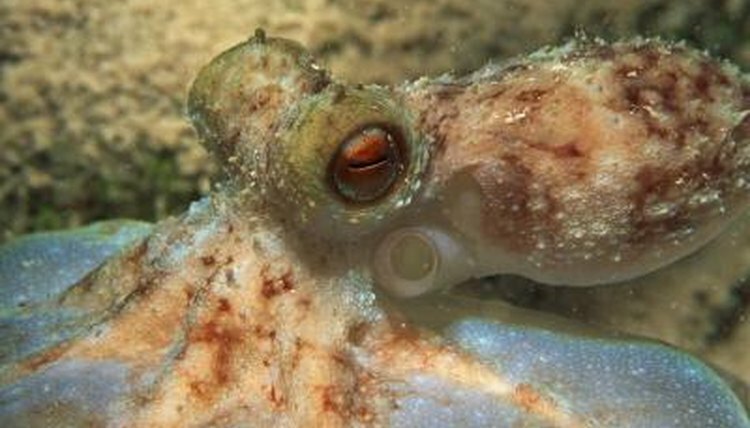 Cephalopods like squids, octopuses and cuttlefish are the most highly evolved mollusk; they even have the most complex brain of any invertebrate. They’re characterized by a completely joined head and foot, with a ring of arms or tentacles around the head. These carnivorous mollusks, like snails, lack the seemingly characteristic shell, though that hardly matters to a cephalopod. Unlike other mollusks, they have an extremely well-developed eye capable of forming images, distinguishing colors and most of all, hunting prey and escaping predators.